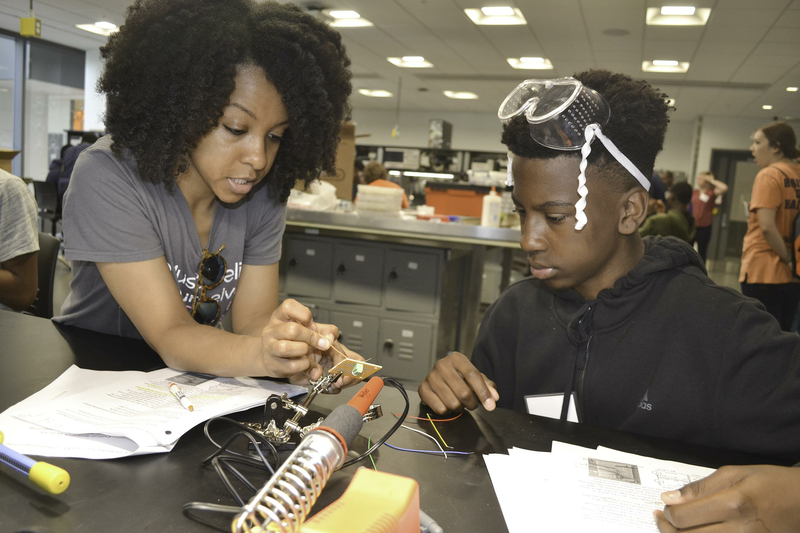 Lonna Edwards helps a camper build a circuit during the 2017 I-STEM Multidisciplinary Summer Camp. Each year, the Celebrating Diversity, Recognizing Excellence (CDRE) event recognizes graduating Summer Predoctoral Institute (SPI) fellows, fellowship recipients, and students for their scholarly work, teaching, and service. This year, ECE ILLINOIS graduate student Lonna D Edwards was honored for her outreach efforts to help introduce STEM to underrepresented students. Professor Lynford L Goddard nominated Edwards for her work as a lab assistant during four separate outreach programs: Girls Learning Electrical Engineering (GLEE), Illinois-ChiS&E Alliance for Nurturing Excellence in STEM Education Leadership (I-CANEXSEL), Illinois Summer Academy (ISA), and the I-STEM summer camp. Professor Goddard and Professor Gang Logan Liu co-advised Edwards for her master's degree and are currently co-advisingfor her PhD. All three are affiliated with the Micro and Nanotechnology Lab at Illinois; Goddard is also a researcher at Beckman Institute. In 2014, Edwards received a NSF Graduate Research Fellowship. She has been a member of the Graduate Engineers Diversifying Illinois (GEDI) Executive Board, a Leadership Certificate Coach, and a member of Alpha Kappa Alpha.